Stanford students spent part of their winter break teaching basic business lessons inspired by the Barefoot MBA, thanks to the program that initially supported us. Through Stanford’s Service Learning Program and ThinkImpact, which provides experiential learning opportunities in rural Africa, a team of 18 students traveled to the Coast region of Kenya to immerse themselves in local culture and learn about social entrepreneurship. For many of us, the major highlight of the trip was the two-day homestay within the Kaloleni community. We lived in small groups alongside community members to immerse ourselves in their day-to-day lives. We slept in thatched huts with mud walls and floors, sharing close living quarters with family members and farm animals alike. We carried water on our heads and ate local food that we prepared alongside the village women. We actively engaged with the community members, learning about their lives, small businesses, hopes and challenges. This experience culminated in a two-day service project in which we worked with community entrepreneurs to brainstorm creative ways in which they could grow their businesses. Many of us were surprised to find that we were able to offer insights into their businesses, and we were encouraged by the depth of relationships fostered between our two groups and within the community members themselves. 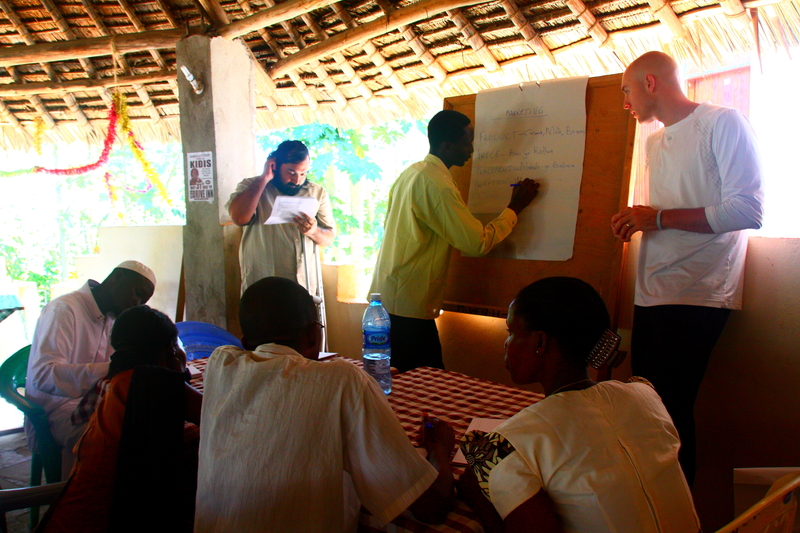 Entrepreneurs worked alongside the team in Kenya, as pictured below. We hope to post more details soon.